For some reason, cruisers seem compelled to tell other cruisers how they are doing it wrong. Perhaps its because all cruisers are a little nervous about putting to sea: theyre seeking internal validation that they are doing it right, so any other approach must be wrong. For relative novices like us, however, this can be disconcerting. People take up the cruising lifestyle for all sorts of reasons and have all sorts of destinations and routes and timetables. Ours took us from the West Coast of the U.S. through the Panama Canal and then over to the Windward Islands. 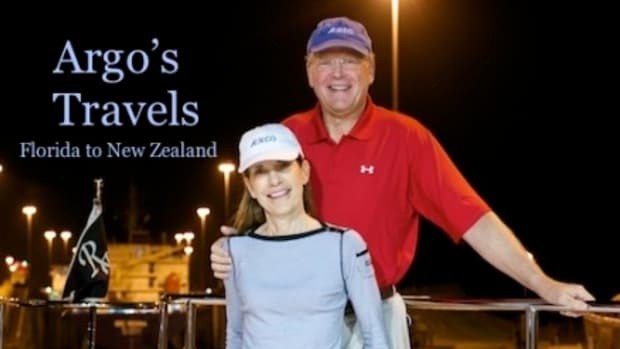 As we sat in the bar at Shelter Bay Marina in Colon after our transit of the Panama Canal, we were still in awe of the canals well-deserved status as an engineering marvel. We struck up conversations with several cruisers who wanted to get our impressions and suggestions for the canal transit, since they were heading to the Pacific. When they found out that we were heading to the Windward Islands, they all immediately told us we were going the wrong way. Very encouraging. While cruising from the Windwards to the Panama Canal might be an easier routedownwind, down-swell, downcurrentit is certainly possible to go the other way. So if your plans take you north and east from Panama, perhaps our experiences can help you. We cruise aboard Antipodes, a 55-foot steel trawler yacht built by Yachtsmith in Nova Scotia. She is not actively stabilized (relying on bilge keels and a lot of ballast), and with her narrow beam, the ride can get lively. On the other hand, she has an incredible sense of ultimate stability when under way, and we have never felt uneasy, despite some ill-advised departures from safe harbors. We left Shelter Bay on December 23 for an easy run to Portobello, Panama. The 4- to 6-foot seas were about 30 degrees off our bow, and the ride was quite docile. Portobello is a nice little bay with an easy entrance and good holding. Other than the fort and a sleepy little village, there wasnt much to see or do in the few days before Christmas. When the 24th dawned with clear skies and calm winds, we pulled up the anchor and headed for El Porvenir in the San Blas Islands. The winds and seas were again quite benign, and we even caught a few tuna along the wayin spite of Laras insistence on having bananas on board (which are supposed to be bad luck for fishing). Some of the anchorages in the San Blas Islands were a little crowded, and we found that using our laser range finder (I use a Bushnell Yardage Pro Compact 800) was indispensible in selecting good spots to drop the hook without interfering with other boats. On our trip to Alaska, I discovered that a laser range finder helps in determining whether you have enough space in a given anchorage, and it also will help you determine if your hook is actually set. Simply back down on the anchor while ranging a fixed point in front of you (onshore, or even another anchored boat). When the numbers stop increasing, the hook is set. When you put the boat in neutral, the boat should rebound on the rode, and the numbers should decrease. Once we were safely tucked behind the reef, we began to get a sense for the seas that were in our future. Large breakers pounded the outer reef while the wind whistled through the anchorage. We use MacWX with our Iridium phone for most weather forecasting when at sea. If we are in port, we use Buoyweather for greater detail when high-speed Internet access is available. We really needed to get moving from the San Blas Islands, since Lara had to fly back to the U.S. to take care of some family issues, so we were anxiously looking for some reasonable weather to get to Cartagena, Colombia. I know that imposing any sort of schedule on a cruising boat is doing it the wrong way, but it was a choice we made. The reports finally showed a decent weather window on January 4 and 5 for the run to Cartagena. This was our first real taste of the wrong way. The planned 30-hour run stretched into 38 hours, with a fairly uncomfortable ride. Our only consolation was that active stabilizers wouldnt have made any difference in the head seas. The forecasted seas were 45 feet on a seven-second period; we experienced 6- to 8-foot seas on about a five- to six-second period. There were even occasional 10-footers thrown in to make it more interesting. This experience became fairly common for usthe actual sea states along this route were typically 25 to 50 percent rougher than forecasted. This contrasts with the seas we experienced on our trip from San Diego to Alaska, where the sea states were usually a bit calmer than forecasted (except on the points). We gratefully anchored for almost a month in Cartagena. Lara dealt with family business, and I worked on boat maintenance. The last week of this period was spent looking for a weather window to allow us to head for Aruba. This portion of the route can be broken up into several day cruises and a couple of overnight passages. We ended up being grateful for the breaks. For those of you who are familiar with Buoyweathers format, they classify weather into three categories: green, yellow, and red. The weather window we chose was yellow, but barely so (slightly higher winds than would allow it to be green). The local cruisers all told us that we shouldnt go. Unfortunately, I made a bad decision to assume it was because they were all sailboats and didnt want to motor for three straight days. This was my first indoctrination into the importance of listening to local knowledge. The barely yellow forecast turned out to be a solid red in reality. We fought through 12- to 18-foot breaking seas for almost eight hours before we were able to tuck into Punta Hermosa and drop the hook with 5060 knots of wind making it difficult to even stand up on deck. There might have been comments about the captains sanity, but the howling winds made it too hard to hear. After two more cautious day runs, we ended up in the Five Bays area, just north of Santa Marta, Colombia. While these bays are beautiful, the incessant williwaws (sudden, violent winds) at this time of year became irritating. We looked forward to a weather window to allow us to make the 40-hour run to Aruba, with a bailout stop at Cabo de Vela if needed. The weather was reasonable until we passed Cabo de Vela. Then, the seas started building, and our main coolant pump started failing. Antipodes doesnt have a get-home engine, and we didnt have a spare coolant pump (it wasnt on the list of recommended spares in our owners manual). This forced some difficult decisions. We could turn back to Cabo de Vela, but there are absolutely no marine services there. We could continue on to Aruba with no guarantee that the pump would keep working. Several frantic satphone calls to Bob Senter from Northern Lights resulted in us slowing down to minimize the stress on the pump and continuing on our way. We also contacted the U.S. Coast Guard on our satphone to let them know of the situation. In the event of a complete engine failure, I wanted them to already know who and where we were. That phone call was incredibly reassuring. The petty officer I spoke to took all our information down and then told me he was passing the info along to Aruban search-and-rescue authorities so they could watch for us, as well. After replacing the coolant pump and making sure everything was working well, we were once again looking for a weather window to continue east. The winds in Aruba are fierce this time of year (flip-the-dinghy kind of fierce), so we were not sure how long we would have to wait. Fortunately, a couple of calm days popped up on the forecast, and we headed for Bonaire on February 18. While the forecast was accurate, the 22 hours of head seas were a little tiring. Bonaire provided a nice period of rest and some wonderful diving. We ran through all of the tanks on board and got them refilled at the dive shop about 100 yards from our boat. While Bonaire is not inexpensive, it is a great place to stop and enjoy the beauty of a Caribbean island. When another weather window presented itself, we headed east again for the Aves Islands. By now, we were really being cautious with our weather window selections, and it started to pay off. We passed up a few departure days that might have tempted us several weeks before, and we were rewarded with an uneventful passage to the Aves and then another uneventful passage to Los Roques. The snorkeling at Los Roques was the most beautiful weve seeneven better than Bonaire. 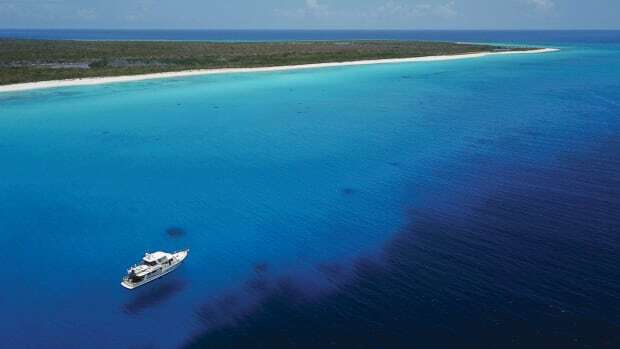 The holes in the reefs at Los Roques hide a number of unspoiled wonders that will simply take your breath away. With an upcoming wedding in the U.S., we couldnt stay as long as we wanted in Los Roques, and the weather really dictated a departure for Bequia in the Grenadines. For the first time in two months, we actually were able to travel at our normal cruising speed of 7 knots. We had become accustomed to planning passages at 45 knots to account for adverse currents and seas, and we felt almost giddy with the unfamiliar sense of speed. At 1 a.m. on March 1, we crept into the open anchorage in Admiralty Bay on the southwest coast of Bequia and dropped the hook in 30 feet of water with good holding. Entering an unfamiliar anchorage in the dark is also supposed to be going the wrong way, but we were taking full advantage of some local knowledge imparted by some cruising friends we had met along the way. One benefit of going the wrong way is that youre always meeting people who have just come from where you are going. If youre smart enough to listen, they can really fill in the gaps in the various cruising guides! Dont believe the weather forecast. Always assume it will be 25 to 50 percent worse than forecasted, and plan accordingly. Always try to have a backup destination. The wind, seas, currents, or a problem with your boat may require a detour. Know where your backup is, and make sure you have a plan for making the decision to go there.